You know what they say, the 3rd Strike is what counts. Make your first move. So what's it gonna be? You're trapped in the new world of Street Fighter III! The third chapter, so what's it gonna be? The 3rd Strike, y'all, it's Street Fighter III! Fightin' for the Future, so what's it gonna be? The 3rd Strike, y'all, it's Street Fighter III! III! III! Welcome to the world of Street Fighter III. Prepare for battle! —Greeting that plays at the character select screen in 3rd Strike. In 1997, Capcom finally released the long-awaited true sequel to Street Fighter II, Street Fighter III: New Generation. It cut the roster of familiar characters to Ryu and Ken, and added a whole slew of brand-new fighters,  including hulking American Alex (who was promoted as the new lead character of the game) plus the new Big Bad, Gill. The game was awaited with incredible hype, given its lineage. However, unlike previous games, III was met with very poor public perception. It's hard to pinpoint exactly why the game failed. Most likely it was a strong case of unrealistic expectations. Some say years of Updated Rerelease of Street Fighter II and Alpha had left audiences apathetic, and the unfamiliar cast turned off casual fans. Also, the learning curve of the game had increased exponentially, mainly because veterans of the games had become so good. This kept away many new gamers, driving Street Fighter III into the margins. Capcom would also released the inevitable updated rerelease a few months later, with Street Fighter III 2nd Impact: Giant Attack, which also added Hugo (the Andore Mook from Final Fight) and Urien (Gill's brother) plus the return of Akuma. In a final attempt, a second updated rerelease, Street Fighter III 3rd Strike: Fight for the Future, was released, and has since become a fan favorite. The game returned Chun-Li to the lineup, added four new character,  rebalanced the system, and is often praised for having the best graphics of any 2D fighter up to that point. While remaining quite obscure, giving its high level gameplay, the game was (and still is) immensely popular for Tournament Play. This popularity eventually gave the game the recognition it didn't receive at the time of its release. Due to how popular it eventually became, and fervent fan requests, Capcom re-released this game on Xbox Live Arcade and the Playstation Network in 2011 as Street Fighter III: 3rd Strike Online Edition; it features online play, enhanced visual settings, and other bonus content. Anti-Frustration Features: If you continue a set number of times in 3rd Strike, the CPU's difficulty level will be bumped down a level. Beauty Is Never Tarnished: Reappears in New Generation and 2nd Impact. Character Roster Global Warming: About 20 characters and two (possibly three) big guys (Alex, Hugo and possibly Q). Colon Cancer: The 2nd Impact and 3rd Strike portion of the second and third title respectively are sometimes treated as separate titles instead of being part of the main title. Die, Chair, Die! : Certain stages allow for this ranging from causing furniture in the background to bounce after a powerful attack to causing a character to be knocked into a different part of the level for another one of the rounds. The Illuminati: Is actually Gill's organization. Practical Taunt: Taunting provides Status Buffs, which is still a rarity in fighting games. Punch Parry: A new Parry mechanic that was added to the game, enabling with the proper timing a player to cancel out attacks by pushing either forward or down as an attack lands. The Smurfette Principle: Elena and Ibuki in the first two games. 3rd Strike added Chun-Li and Makoto. Updated Rerelease: Played straight with 2nd Impact. 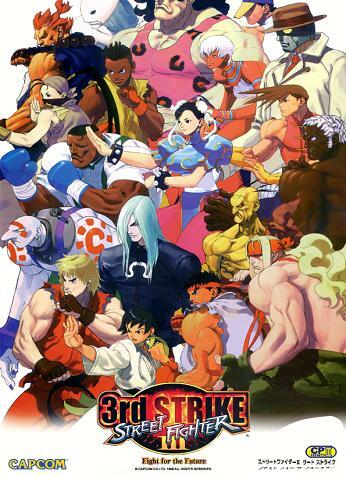 Subverted with 3rd Strike which is actually a sequel storywise.